A true treasure and work of art. This beautiful Bible Pendant opens to reveal the complete Lord's Prayer inside in the original King James version of the Bible. Secure latch holds the bible closed when not open. Pendant measures 9/16" tall x 1/2" wide (or almost 1" tall with hoop/bail). A true testament to the love and art of our Creator and love of the Word! 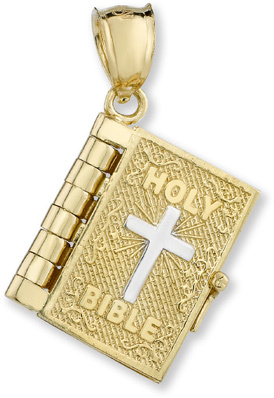 We guarantee our 14K Gold Bible Pendant with Lord's Prayer Inside to be high quality, authentic jewelry, as described above.